PSSST! Wanna buy a South Pacific island? One that's just three hours or so from Brisbane, with a little resort tucked into a thumbnail of its 72ha (180 acres) – and rated by TV's Getaway travel program "one of the 50 best hotels in the world?" Your island in the sun on which to build your own secret place for family or maybe investment-mates in its rainforests or along its beaches, and far enough away from that little resort – that takes up just 5% of the island – that you could be on another planet? 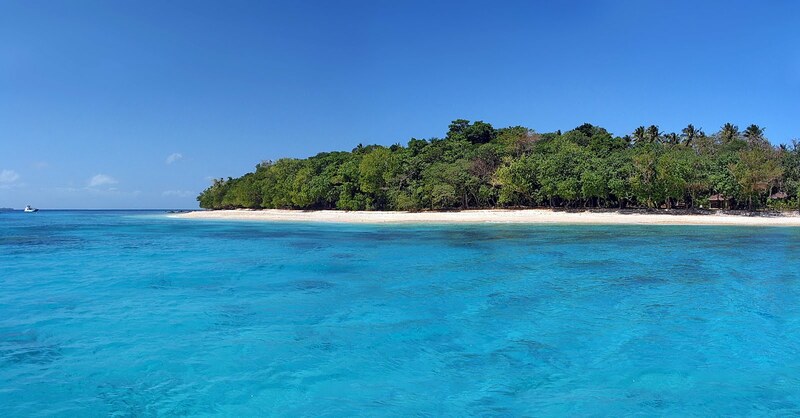 This rare little gem is called Bokissa Private Island Resort, just off Santo in the north of Vanuatu, and made famous by James A. Michener who penned his famous Tales of the South Pacific about its beauties and mysteries after serving there during the Pacific War. Retired Brisbane businessman, Dave Cort went there for a diving holiday with a mate in 1993, and jokes now about "becoming an accidental South Pacific island resort owner." "We went to Bokissa for the-then daily shark feeding dive," Dave says. "It was pretty run-down and I didn't think a lot about it, but the next year I went back with our son Alan, who was then 26, and we stayed there. "It was even more run-down, but it's natural beauty got to me, and we went back a few more times… each time finding it more run-down than before, and in 1998 learned it was for sale – in fact almost sold – by a Melbourne group who owned the lease. 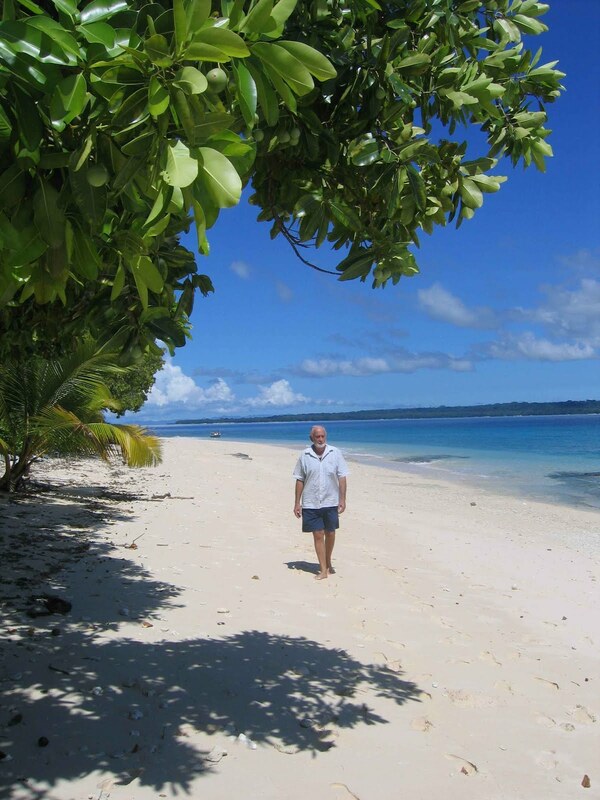 "Out of the blue I made a bid – and with absolutely no knowledge of the hotel industry, suddenly found myself an accidental South Pacific island owner." Dave and wife Jan, with Alan, moved up to Bokissa soon after, and got into the mammoth task of renovating the run-down resort, landscaping its gardens and putting-in the infrastructure that would make it liveable for themselves – and more desirable for guests. Today Bokissa Private Island Resort has fifteen private bungalows – called farés – amongst the trees on a beach of talcum-white sands melding into aqua waters. Vast coral beds swarm with myriad fish and marine life, there are boats for reef and sport fishing (marlin, sailfish, mahi mahi, wahoo, dog tooth and coral trout,) and fly-fishing as well. On Bokissa itself there's a 25m pool with swim-up bar (currently under renovation,) landscaped gardens, bushwalks through the rainforest and along the beaches, wartime relics, snorkelling, kayaks and sailboats, volley-ball, soccer field, giant outdoor board games... and a library for something to read in the hammocks between the trees. Dave and Jan are long-retired – again – but still living on the island, with the resort managed by Alan who married a local staff member, Elizabeth in the island's own church (that's been used by numerous guests for also getting married;) Alan and Elizabeth have four children who attend their island school. 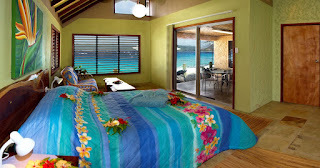 If owning all or part of this sounds like your idea of heaven in the Pacific, drop Dave a note on dave@vanuatu.vu. 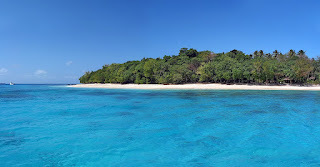 ISLAND in the sun: Bokissa Private Island's Resort occupies a thumbnail of the 72ha island and can hardly be seen. DAVE Cort takes his daily walk – beats dodging city traffic. COOL retreat at day's end… the pool by night. ROOM with a view: room in one of the inter-connecting double bungalows. MILLION dollar views, and a hop, step and a jump into the water. DIVING is spectacular over vast beds of corals alive with marine populations.